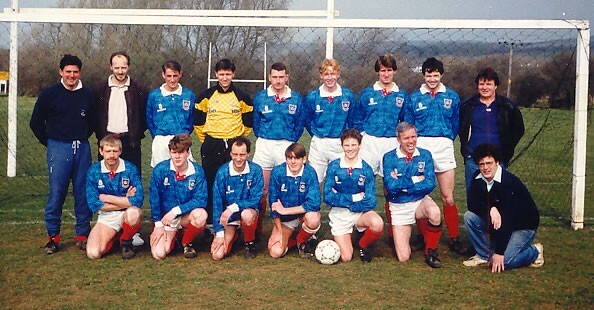 The Isle of Wight Branch of the Portsmouth F.C. Supporters Club was founded in 1956, and existed as a sub branch until 1978 when it was set up in its own right as the “Isle of Wight Pompey Supporters Club”. The end of season dinner/dance was always the big event of the season for the Supporters Club. Dinners were held every year up until 2002. Gradually it became more difficult to get players and members of the coaching staff to attend and this culminated in 2003 when we were told that the club would not be attending on the day of the event. Bearing in mind all the time, effort and expense that goes into organising a dinner, the committee decided to scrap the idea of having a dinner, deciding to organise other events for members instead. (See below for a list of Annual Dinners). Our UEFA Cup campaign saw us run our first overseas trip to Wolfsburg. The ever increasing cost of match tickets and the fact that virtually every match is now all ticket, means that we now generally offer an all in package of travel and match ticket and we will continue to run trips where there is a demand for it. (See below for list of away trips). One of the initial reasons for setting up the Isle of Wight Branch was to make it easier for members to get to home games. In the 1950’s when Pompey were regularly getting crowds of 35,000, queues would form at Ryde Pier to board the ferry, and so supporters club members were offered coach or bus transport from Portsmouth Harbour to Fratton Park. Over the years the Supporters Club has arranged with Wightlink/Sealink/British Rail for extra sailings of the passenger ferry or catamaran from Portsmouth Harbour, especially for evening games, and also arranged for late evening sailings to be delayed to suit kick off times. In 1987 the club supported a new venture set up by Wight Line Cruises, which offered a ferry and coach transfer to Fratton Park. This service ran until 1998 as an alternative to the Wightlink catamaran and had the benefit of supporters all travelling together. This period also saw the introduction of the score prediction competition where supporters could predict Pompey’s first goal scorer and the match result, with the winner taking a percentage of the total kitty. The Supporters Club have always acted as a focal point for the selling of tickets to Isle of Wight Supporters for popular all ticket games. The biggest and most memorable occasion was for the F.A. Cup tie against Southampton in 1984 when we sold 500 tickets at the Marine Hotel in Ryde in less than an hour. The F.A. Cup semi final against Liverpool in 1992 and the subsequent replay saw us sell 150 tickets for each game. On that occasion the tickets were sold as part of a package that also included ferry and coach travel. The 2008 and 2010 F.A. Cup campaigns created huge headaches as demand far outstripped supply, especially for the semi finals on each occasion. Again a package including ferry and coach travel was offered, although it was optional on those occasions. 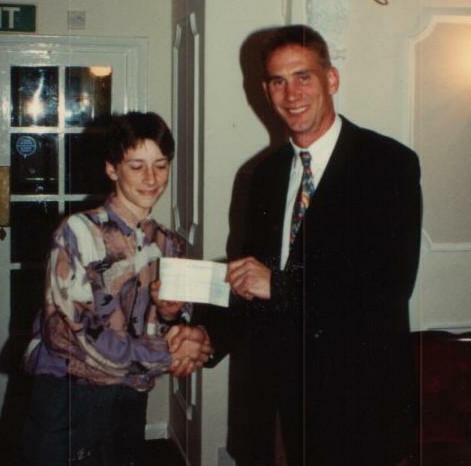 The Supporters Club have regularly supported Pompey with donations, usually made at our annual dinners. Over the years we have bought specific items for the club, including medical equipment, playing kit and items for the disabled supporters section, as well as sponsoring players kit. In the Autumn of 1976 we became actively involved in the SOS Pompey campaign, when PFC appealed for supporters to help raise funds to keep the club going. While Pompey sold squares of the Fratton turf, and made collections at each match, on the Isle of Wight the Supporters Club sprang into action. Meetings were held on a weekly basis and newspapers were collected, stored, and then sold to raise funds. It seems ridiculous now to think of selling old newspapers to help keep the club alive, but back in 1976 our efforts were very much a part of the SOS campaign. Committee members Bob Jacobs, Rex Haines and Tony Best were very much at the forefront of this at a critical time for the club. Other fundraising events held at the time included two strip shows at the Ponda Rosa and a fashion show at the Grantham Hotel in Cowes, where some of the Pompey team of the time acted as the models. In the 1970’s under the guidance of Tony Best, Graham Dubber and Bob Jacobs, we formed a Sunday morning football side to play friendly matches. We played a handful of games each season but this increased in the early 1980’s when an influx of younger players prompted us to play up to 25 games a season. In 1986 we applied to join the Isle of Wight Sunday League and competed in the league for 9 seasons, gaining one promotion during that period. Interest waned during our last season and the decision was taken to resign from the league at the end of the 1994/5 season. Initially correspondence to members was limited to the occasional letter that would notify them of an upcoming event, i.e. dinner, A.G.M. etc. This began to change in 1985 when first issued a Supporters Club journal called “The Blue and Wight”. This was issued in a simple A5 book format and informed members of club news, with other articles related to Pompey or football in general. Members were also invited to contribute their own thoughts and “The Blue and Wight” was issued quarterly in that format for seven years. The design was changed to more of a fanzine in a glossy A4 format for five years before the final issue at the end of the 20th century. In 2000 a new newsletter format was produced and this exists to this day, although the style has constantly changed, keeping members informed of latest events. In recent years we have focussed more on fundraising with regular events such as Race Nights, Quiz Nights etc, with the aim of making a large donation to a local charity at the end of each season.